Black Friday has come and gone and it's almost December, so let the Christmas countdown begin! In a week or so you'll start collecting holiday cards from friends, family, and the dentist's office, which means that you'll need to reciprocate with cards of your own. Now, we're not huge fans of the typical "matching sweaters in front of the tree" theme (or really any photo card unless it's an adorable child or pet dressed in people clothes), so we decided to pick out a few cards that are stylish, fun, cheerful, or otherwise solid choices that will save you from being mocked at the next holiday gathering. Celebrate Christmas this year with this layered holiday card available at Target. 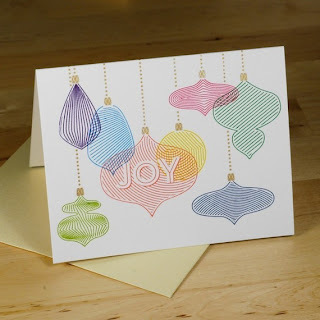 It's sure to make your card stand out from the rows upon rows of greeting cards lining your friends and family's fireplace, and a little texture goes a long way. For a traditional look featuring Santa and his reindeer, try this letterpress set by Kirtland House. Maybe it's the vintage design or the ornate font, but something about these cards just remind us of "A Miracle on 34th Street" (the original one, not the one with the little girl from Mrs. Doubtfire). 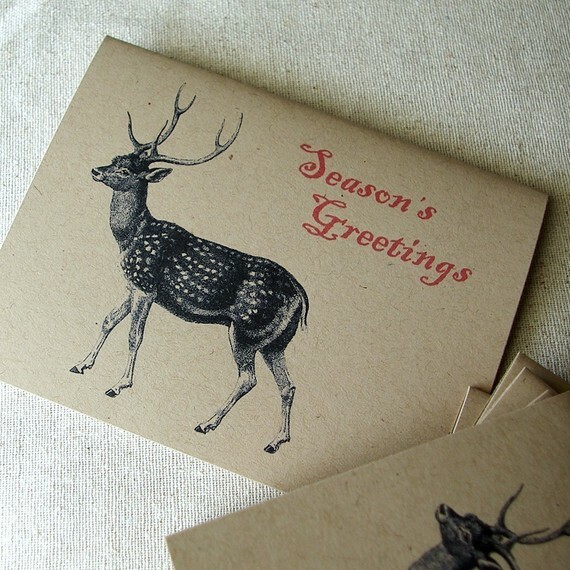 We can just picture writing out these cards in front of the fireplace with a mug of of hot cocoa... how wonderful! Even though red and green are the traditional colors of the holiday season, we're partial to blue and silver. 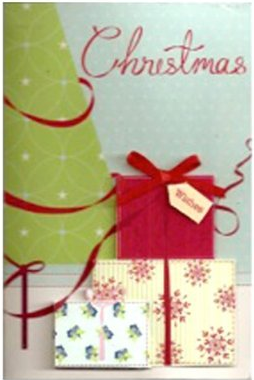 It tends to stand out a little more from all the other cards, and looks a bit more chic. 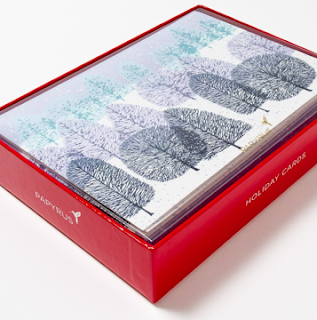 Share visions of a winter wonderland with this set of cards from Papyrus. It's simple, pretty, and a little bit glitzy, which is just the way we like it. A partridge in a pear tree in metallic gold? Yes, please! We love these screen printed cards by treasurydesigns. They are whimsical, fun, and sure to stand out with their beautiful metallic ink and simple white silouhettes. And they are printed on recycled paper, which is always a plus. 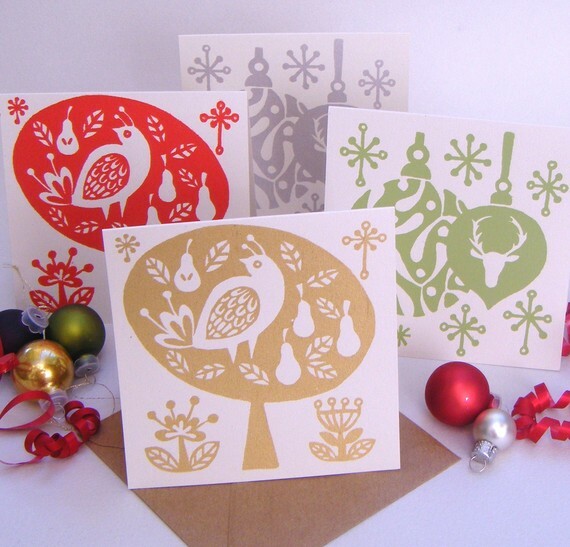 Too much tinsel can be a headache, so be low key this holiday season with these printed cards by Etsy seller thecraftpantry. We love the earthy feel to these cards, and think it's a lovely, understated way to say "Season's Greetings." Celebrating Hannukah? We found the cutest card to wish your friends and family a Happy Hannukah this year. 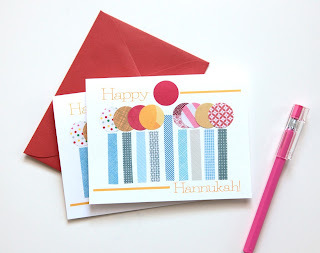 We love this handmade card from cutiepiecompany for it's totally mod, bright, and fun menorah design. 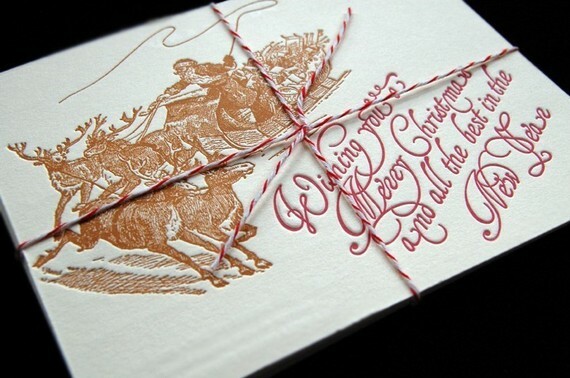 Send your wishes with this card and you're sure to make their holiday cheerful. 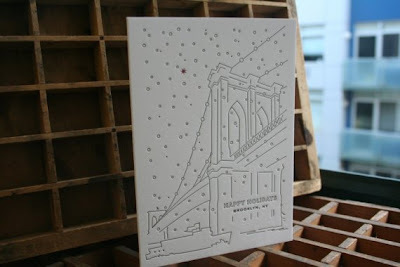 Saira longs to be back in Brooklyn, so we had to share this Brooklyn Bridge holiday card by Moon Tree Press. Perfect for New Yorkers, this card adds a nice personal touch, especially if you have friends and family across the country. These cards by desTroy are simply charming. We love their simple design, bright colors, and the beautiful layered look that the screen printing creates. 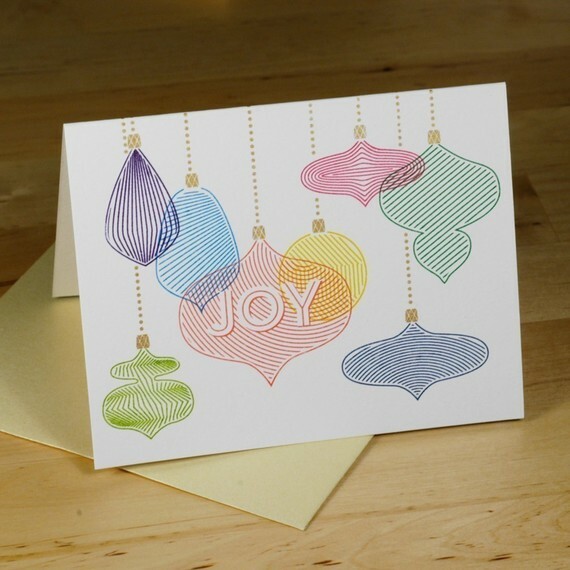 This cards definitely make a statement and is sure to be a favorite this holiday season. While the holiday season is all about peace and love... it also makes spending hours at the mall a selfless act. We at PDR are all about peace, love, and shopping, which is why we love these sassy retro holiday cards by Anne Taintor. They are fun and fabulous, just like you! Feel good this holiday season with this holiday card from UNICEF. 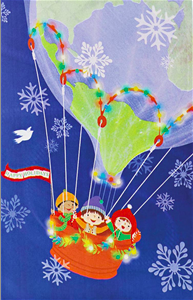 Every year UNICEF produces a series of holiday cards representing all the children that UNICEF helps support. This years design is just as sweet, and proceeds from the sale help children all around the world, so not only will you feel good, but you'll also do good this holiday season. Be sure to check us out tomorrow for a special holiday announcement!